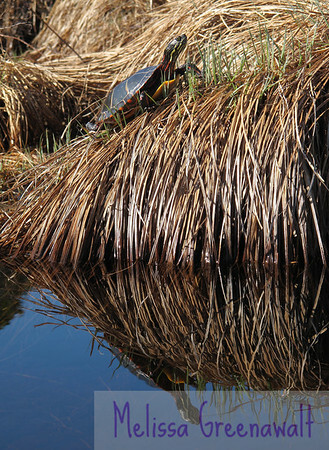 The painted turtles were out in force at Campton Bog. I came around the bend in my kayak and heard a "sploosh! "...but I couldn't find the source. Another sploosh...still no sign of anything. Then I happened to look a little further beyond, and there were these turtles, sunning themselves on the vegetation. Dozens of them. I had some trouble getting close enough slowly enough, but I think I lucked out on this guy/gal. Seconds after I shot this...sploosh!